Flavor Trio only $12.99!!! 50% off promo code inside! Start your year off right with Uptown Vapor! A New Year, A New You, come on in and let us help you get off the stinkies! We have received a shipment of new inventory and have everything you need to kick the habit. Let our friendly staff assist you and get you back on track to a better you coming into this New Year. We look forward to seeing you, and the Team at Uptown wishes you a Happy New Year!!! 50% OFF CYBER MONDAY MADNESS!!! DON'T MISS OUT ON THIS E-LIQUID BLOW-OUT SALE!!! Did you know that you can earn CASH BACK just by buying our Uptown Gourmet juice made fresh to order??? Come in and see us today and ask one of our awesome staff members about our Rewards program and leave with a shiny new rewards card, who doesn't like to earn cash every time they spend? What are you waiting for? Be sure and show your favorite Uptown Fam some love and cast your vote! contact our team @ info@uptownvapor.com and we will get back with you promptly. The product we sell are not smoking cessation products and have not been evaluated by the Food and Drug Administration, nor are they intended to treat, prevent or cure any disease or condition. ]]> Sat, 26 Nov 2016 17:08:34 +0000 <! [CDATA[50% Off Promo Code - It's that time again! ]]> http://us12.campaign-archive.com/?u=e86e766e8a7cfb12fafc879ce&id=0c5d42fffa http://us12.campaign-archive.com/?u=e86e766e8a7cfb12fafc879ce&id=0c5d42fffa 50% Off Promo Code - It's that time again! Saving has never felt so good! Can't make it to one of our locations today? Now you don't have to miss out! We are offering our popular 1/2 price Gourmet E-liquid for all of you out of towners and people that can't make it to one of our stores during our regular 1/2 OFF special hours. at checkout when you put 2 or more bottles of our Gourmet E-liquid of your choice in your cart, and BAM!!! Instant savings! Don't miss out on this opportunity to receive high quality E-liquid at a huge discounted price. This delicious blend of Strawberries and Juicy Watermelon is sure to please! Copyright © 2016 Uptown Vapor LLC, All rights reserved. ]]> 50% Off Promo Code - It's that time again! Come see us this weekend for a good SCARE!!! ALL HALLOWEEN FLAVORS HALF OFF THROUGH MONDAY!!! Use Promo Code: TEAMSCARE in your cart @ checkout. Show this newsletter via your phone or print off for $2 off!!! Come see Jeff Olver and let him make you look GOOD! Our Fortune Teller was at Scream World in Houston for 9 years prior to joining us at Terror Nights Haunted House. Come see her and be amazed! Be sure and come hungry! 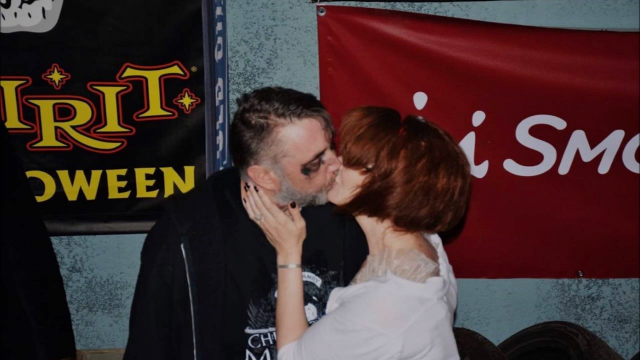 Our Star Haunter Jamie aka Dot and his special lady are getting married!!! We want you to join us for this special Haunt Wedding! Copyright © *2016* *TERRORNIGHTSHAUNTEDHOUSE*, All rights reserved. Also don't forget that our Boobie Love is Half off for the month of October!!! Support the Boobies!